Your micro SIM is supplied with the device. First, you need to push it out from the standard SIM (full size) that's provided. Make a note of your 4GEE WiFi number on your Keep Me Card, which can be found on the back of the SIM packet. 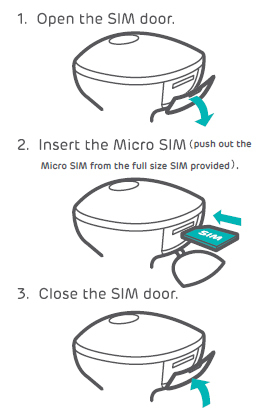 Now, simply open the SIM door of your Car WiFi and insert the micro SIM as shown in the steps below. Close the SIM door and you're ready to connect. It's important to use the right size SIM so don't push it in if it doesn't fit. If your Car WiFi has no SIM or it has been loaded incorrectly, you should see a SIM warning page when you type in a URL on your connected device. However, if you type the desired URL in the search bar rather than the address bar on your connected device you'll just see a blank page.